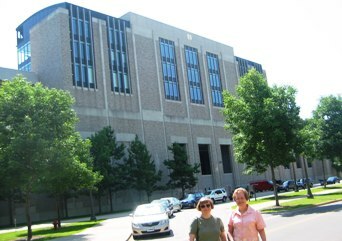 We visited the campuses and saw the stadiums at Notre Dame in South Bend, Indiana; University of Michigan at Ann Arbor; Michigan State at East Lansing; Iowa State at Ames, Iowa. 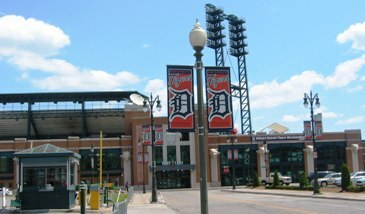 ������������.. We saw several ballparks: Hubert Humphrey Metrodome in Minneapolis, home of the Twins; Miller Park, home of the Milwaukee Brewers; Tiger Stadium, home of the Detroit Tigers. In our travels in the United States, we often visit campuses of nationally known Universities, Football Stadiums and Ball Parks. There were many of these to see in the Mid-West. 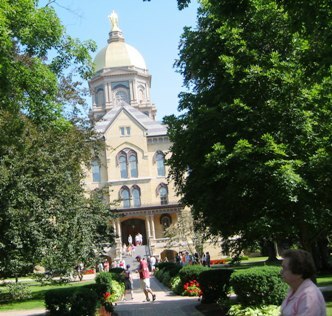 We visited the campuses and saw the stadiums at Notre Dame in South Bend, Indiana; University of Michigan at Ann Arbor; Michigan State at East Lansing; Iowa State at Ames, Iowa. 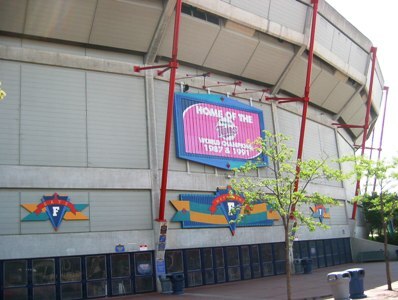 We saw several ballparks:Hubert Humphrey Metrodome in Minneapolis, home of the Twins; Miller Park, home of the Milwaukee Brewers; Tiger Stadium, home of the Detroit Tigers. 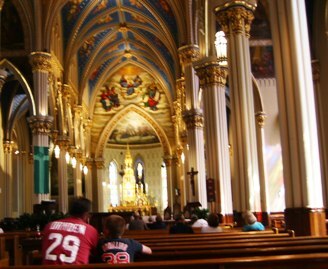 All of these places have much history and uniqueness. 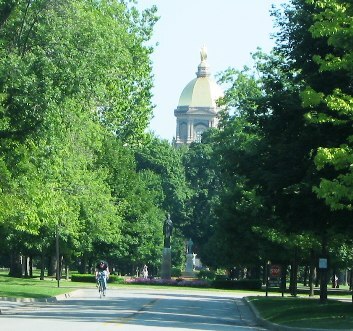 The Notre Dame Campus is tree lined and has beautiful buildings. The Library, Chapel and Gold Dome Main Building are very impressive. We enjoyed walking over the campus which was quiet and reflective. Michigan Stadium seats over 100,000 fans and is the largest college stadium in the country. Michigan is frequently in the top rankings in College Football and the stadium gets a lot of Television exposure. Michigan State’s Spartan Stadium at East Lansing is not as impressive as Michigan’s but State is also a powerhouse in college football. 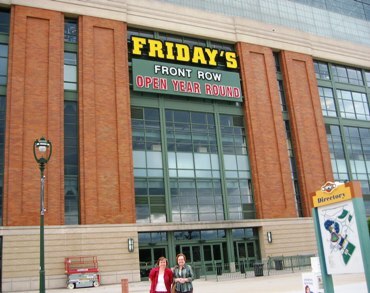 Miller Park has a Friday’s Restaurant inside the stadium. The restaurant has windows and a view of the field similar to club level boxes at other stadiums. Jennifer joined Betty and me on Friday, July 16, 2009, in Milwaukee and we had lunch at Miller Park. Jennifer is a big Braves fan and is very familiar with baseball teams. The lunch at Friday’s was delightful and a trip highlight. 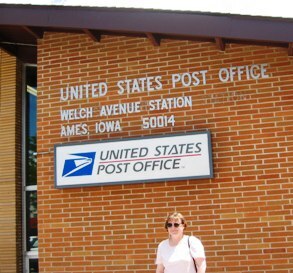 Iowa is the home of the Presidential Caucuses during presidential election years. The Republican straw poll is held at Iowa State in Ames, Iowa, over a year before the year of the election and starts the process. Riding in Iowa, you see many city names that get a lot of coverage during Presidential Election Cycles during the Iowa Caucuses: Davenport, Des Moines, Ames, Sioux City, Waterloo, Iowa City and Cedar Rapids. Betty and I spent some time in St Paul and Minneapolis for two days before we met Jennifer in Milwaukee on July 16. 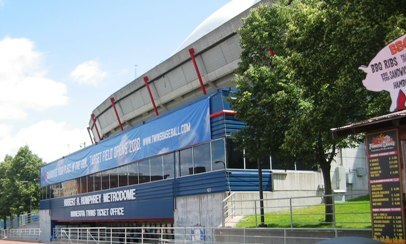 We had lunch at a nice restaurant on the corner opposite the Hubert Humphrey Metrodome. 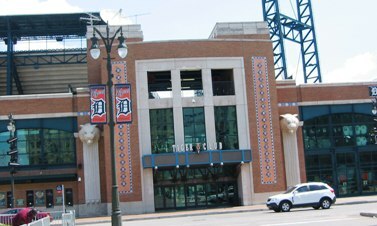 We saw Tiger Stadium, in Detroit but did not visit the home of the Detroit Lions where Matthew Stafford (UGA alumnus) is now playing. We did ride by Ford Field.